The House Temozón 17 is a project which originated from the need to create sustainable modern architecture that also adheres to sound bioclimatic principles. 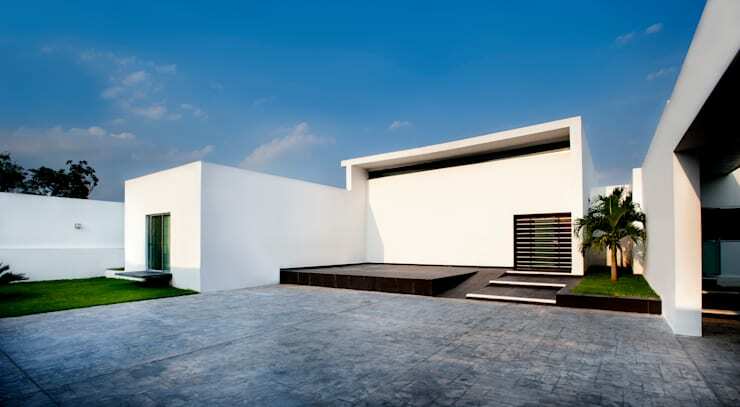 Arturo Campo Architects are based in the vibrant Merida in the state of Yucatán, and therefore have a very good understanding of traditional Mexican architecture, as well as contemporary design, trends and methods. With the Yucatán's colourful Mayan and colonial heritage, the architecture firm had a multitude of inspiration to draw from, but had to keep in mind the area's specific climate as well, which is very warm. As we'll see upon closer inspection of the house, the architects found several strategies to address these design requirements, whilst also creating a beautiful modern home. Following the lines of simple, yet elegant geometry in the plan of the house, the building is divided into three main areas that make up the total space. It is a home that is powerful in its bold minimalism, with a few warmer features to bring a sense of balance to the spaces and connect to the country's warm-blooded heritage. If this sounds exciting, we can assure you that it is. Come take a look! Here it is: a simple, boxed structure. Now we can already see the level of minimalism we spoke about in the introduction—a simple home with resources spent on doing what counts—bringing the structure in harmony with nature and adapting the house to the environmental needs to ensure optimal comfort. The home is by no means unattractive, thought, as this type of pure, geometric design is very popular in contemporary styles. The architects played around with the placement of openings in the home's façade. The middle volume of the structure houses the front door in the right bottom corner, while we can see a strip of high windows across the width of this component of the house. This allows for sufficient natural light and ventilation to enter the home, while creating a striking visual effect on the façade. The dark stone porch and textured driveway creates a stark contrast with the bright white building, and ensures the division between negative (driveway, porch) and positive space (building). This interesting technique draws all attention to the home, and makes it look slightly larger. Enter into the living room of this modern home. The space is large and open, which should make for a continuous feeling of freshness and for good ventilation. In fact, the architects planned this feature for exactly that reason. Making use of very high ceilings for the building was a bioclimatic design technique employed by the architects with regards to the area's warm climate. 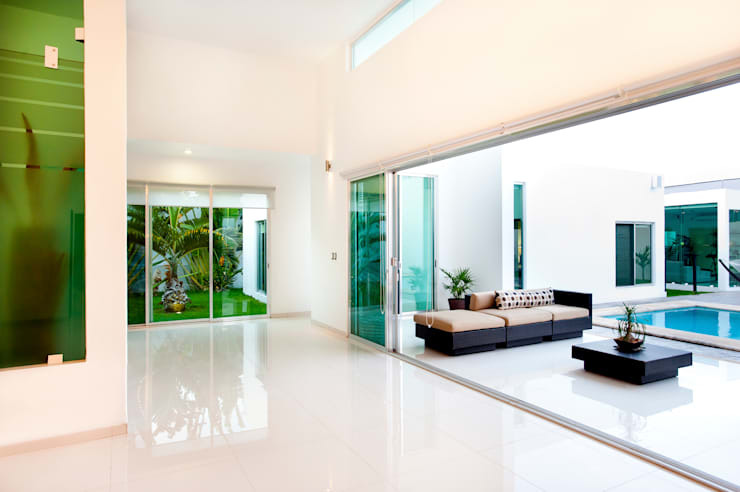 The high ceiling and high placed windows allow for more effective ventilation to ensure the inhabitants' climatic comfort, even in the Yucatán's hottest days! The living room furniture is also fairly simple, but the designers made use of a subtly varied colour palette to bring a sense of visual warmth to the room against the cool visual and physical background. What really catches the eye in this space is certainly the lighting fixtures. Wanting to ensure disperse light across the entire space without overloading the ceiling with lamps, the designers came up with a creative feature and alternative to the conventional chandelier. These spectacular features consists of thin LED tubes arranged in the form of the the double helix of a DNA string. It is a beautiful act of biomimicry (the imitation of nature to solve complex human problems) that suits this modern space perfectly. 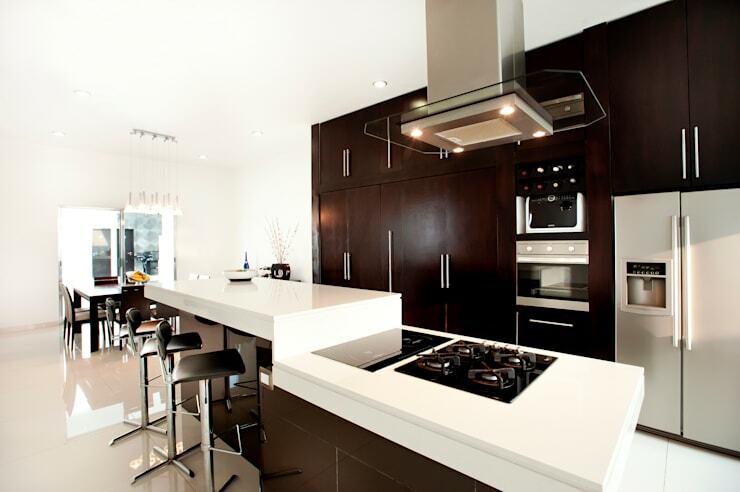 The kitchen of the home is as modern as the other spaces we have seen so far. Here, however, there is a larger emphasis on functionality, which is a coveted characteristic of any food lover's kitchen. Everything in the kitchen is designed around its function, and space is used wisely to ensure that its use will be effective. For example, the stove and hotplate is situated right across from the conventional oven, in order to ensure that you don't have to run around when cooking (or baking) multiple dishes. The storage space also conforms around the appliances in a relatively small area, as to ensure all your ingredients close at hand when whipping up your family's favourite meals. The cabinets, drawers and woodwork surrounding appliances are in a dark wood, contrasting with the white laminate of the kitchen counter. Not only is this contrast aesthetically pleasing, but the white counter also ensures clear visibility where it is needed most. For more inspiration, check out these: 7 Ways To Furnish A Functional Kitchen. 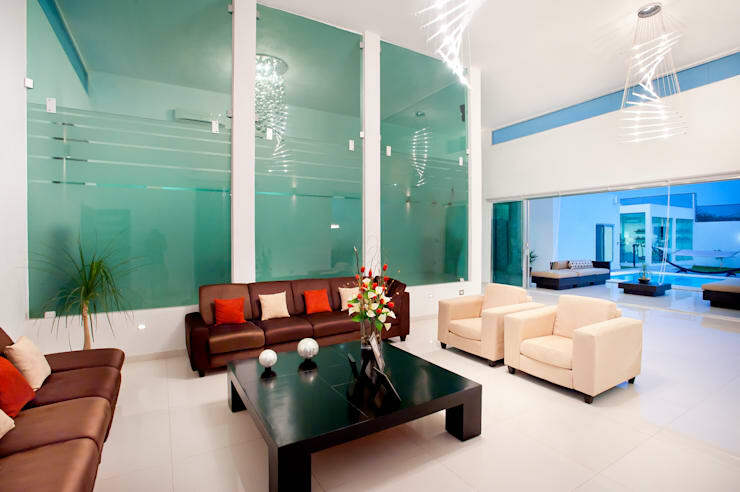 Here we find ourselves in a spacious area between the living room and patio by the poolside. The division between the interior and the outdoors is a set of large sliding doors which opens up almost the entire side of the building to the exterior. This, once again, ensure good ventilation, but also adheres to the ethic of the architecture firm to harmonise with nature and the building's environment. This ethos is taken a step further by a feature that we can see in the rear of this image. A luscious, green courtyard graces the interior of this grand structure! The architects included this feature not only to improve the overall air quality of the house, but also to promote the serenity and psychological well-being of the inhabitants. Indoor gardens in modern homes are great tools in improving general health, but especially in improving your state of mind! We have seen what this modern architecture project can achieve with minimalistic style, some striking elements, commitment to functionality, and balancing with nature. But now we come to the realm of extraordinary modern comforts. The swimming pool area is surrounded by a patio leading out from the living areas of the home, ample space for comfortable deck chairs, and even a fully-equipped poolside bar! What more do you need to throw the best parties on the block? It is the perfect division of space to allow for large parties were segments of people with different interest will convene in different spaces, but the open design of it all also allows for full integration and mixing. You surely cannot go wrong with using this outdoor area as inspiration for your own home. That is, if you'd like to be the perfect host! That brings us to the end of our tour of the House Temozón 17. We hope you enjoyed it as much as we did! We'd love to hear your opinion about the innovative light fixtures in the living room! What else did you like about the home?